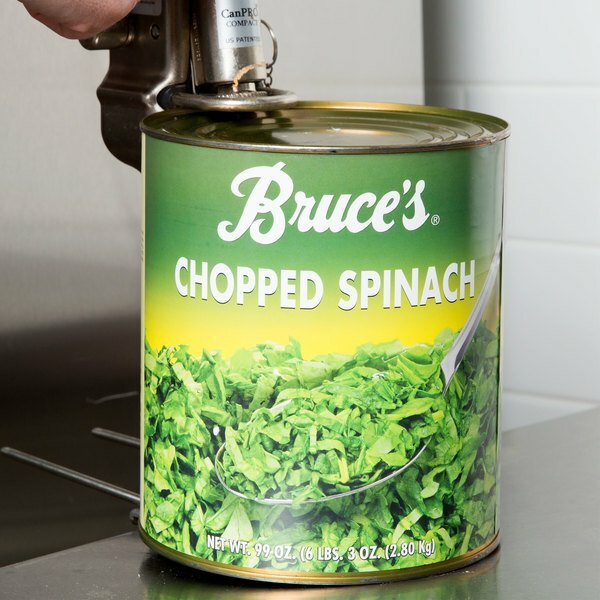 Enhance your flavorful dishes with this Bruce's #10 can chopped spinach, and bring authentic, natural flavors to your table without the hassle of storing perishable produce. Offering the time-saving convenience of canned vegetables, this rich, chopped spinach is preserved in water to maintain its ideal texture and freshness and can be simply heated and served! Low in fat and calories, yet iron rich, customers will love this versatile ingredient in many of their favorite dishes. Spinach has a tender and mildly sweet flavor that is light and refreshing. Try it in a delicious Mediterranean or Indian dish, or use it in quiches or casseroles. Prepare a creamy and delicious spinach and artichoke dip, or whip up a classic creamed spinach dish. Spinach also pairs well with pasta, onions, tomatoes, olive oil, bacon, and much more. Looking for the mild taste of fresh spinach to serve with both lean and hearty entrees? Rich in vitamins, nutrients, and antioxidants, look no further than this chopped spinach! 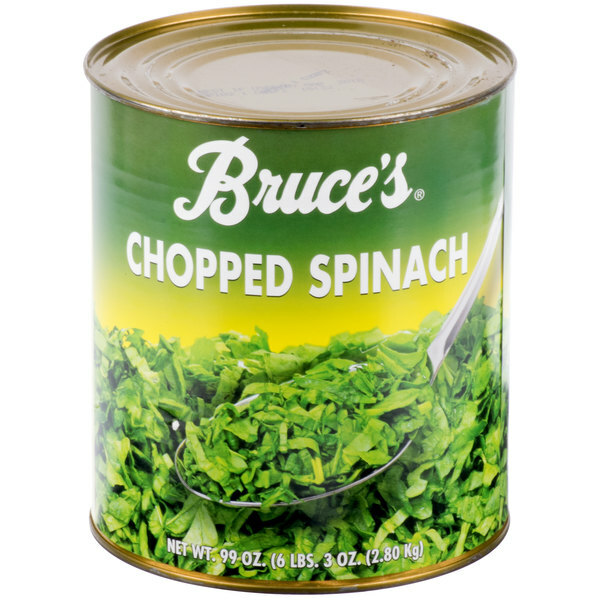 Bruce's chopped spinach is great and very tasty. The spinach is excellent for making dips and adding to soups. The quality is unbeatable and its very fresh. I was alittle skeptical because I never ate can spinach before but for the cheap price I had to try it! I used it in my spinach dip it was great! The chopped spinach is fabulous and really good texture. A great way to make our spinach Florentine quickly. A great find and well packaged in the brine for freshness. We bought this product to try it out, and it exceeded our expectations. This is good quality spinach. Like most of the canned goods on this website, it doesn't have a lot of extra stuff in with it that you don't want. Just a few simple ingredients. That's a huge plus for me! This product is good for making spinach souffles and spinach quiches. It has a large amount per can. The price is a definite plus for this. Purchased this for making creamed spinach which I then freeze the product is superior and holds up well not too watery. Great all around product. The spinach tastes as close as one can come to cooking it yourself. Some may prefer a saltier variety, but this spinach is earthy good. I like to add vinegar and more salt, garlic, and/or pepper. The salsa works well with this brand. This spinach has a great taste. I like the taste of it, but the picture you see on the can is very misleading. What you get is canned spinach not that fresh looking spinach in the picture on the can. After the first #10 tin is down the hatch this industrial strength spinach will help you rip the lid off the next tin with your bare hands! Bruce Foods are great! the chopped spinach are great for making soups and especially spanakopita. 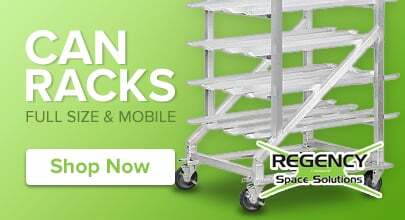 It saves you all the extra work and isnt expensive to buy. This spinach is great for adding in with other recipes. I prefer fresh spinach if I am going to be eating by itself but as an addition, it adds everything fresh spinach would but for a much lower price. Allens popeye chopped spinach is great for cassroles, soups, dips, and you can put seasoning in them and serve them as a side dish. And its a great price! Allen's popeye chopped spinach is so good. I make different caseroles with it or put my own seasoning and serve as a side dish. Good Price. 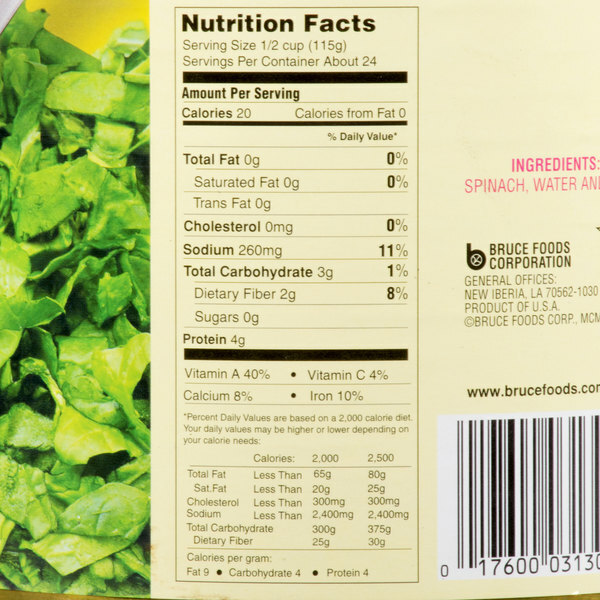 This is a great alternative to frozen packs of chopped spinach! 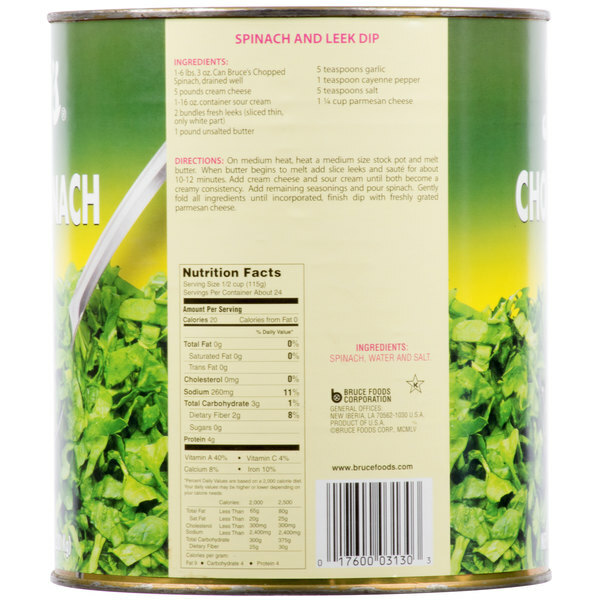 It is great spinach for using to make creamy spinach gratins! The flavor is great!! 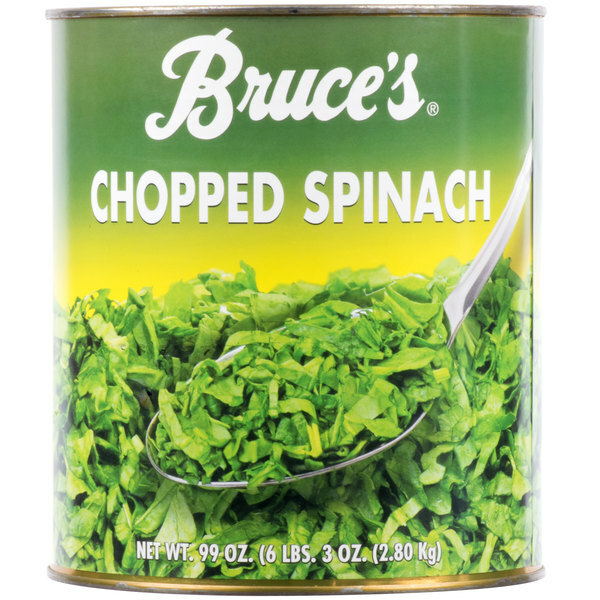 This is a great brand of chopped spinach. It is a great addition to multiple recipes such as soups, omelets, and even in different types of fillings. My all time favorite brand of spinach. By far the best canned spinach you can buy and at this price how can you not buy it.